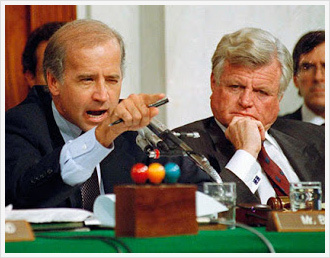 The pro-death, or so called "choicer's" lobby led by Ted "Chappaquiddick" Kennedy & Joe "I'm a good Catholic" Biden try to destroy Thomas with ugly and vile attacks on his character...if a Republican would have done what he did to Thomas, the media hounds would have shouted from the roof-tops, "the GOP is racist!" 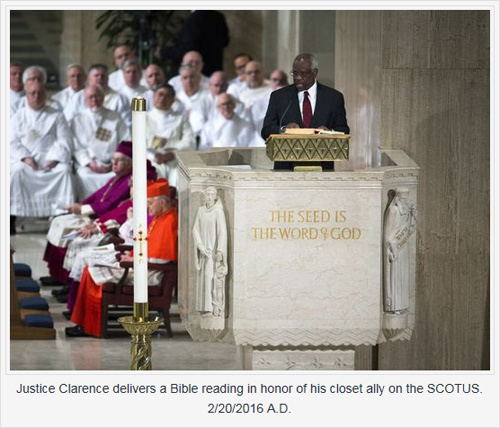 Look @ the 1st pic from Justice Scalia's funeral on 2/20/2016 A.D.
READ this short article: NAZIS, NUREMBERG & the LAW of GOD...http://www.wnd.com/2007/04/41028/ In it you will find the ultimate source of LAW for all Nations. This next SCOTUS appointment will be a profound one, affecting America for a long time. Will our Limited government representatives stand up to those who would deny the Declaration of Independence?